lifeissues.net | Global Warming Science? Nope, Global Warming Scam. Search || Home » Mosher » Global Warming Science? Nope, Global Warming Scam. Global Warming Science? Nope, Global Warming Scam. How do you create a Global Warming panic when the weather isn't cooperating? Here are a few tricks of the trade that the scammers are using to explain away the recent cooling trend, as revealed by the hacked e-mails of the world's leading advocates of man-made Global Warming. As you read these disturbing e-mails, bear in mind that Obama administration officials remain determined -- scandal or no scandal, fraud or no fraud -- to compromise the future prosperity and security of our country by their CO2 cap-and-tax schemes. Phil Jones, who directs the Climate Research Unit (CRU) of the University of East Anglia, was emphatic in his 21 February 2005 e-mail to American Mike "Hockey Stick" Mann and two others: "I'm getting hassled by a couple of people to release the CRU station temperature data. Don't any of you three tell anybody that the UK has a Freedom of Information Act!" Here Jones appears to violate a basic rule of scientific research, namely, that you make your raw data available on request so that others can verify -- or disprove -- your hypothesis. Why would the CRU director not be happy to turn over his evidence of climate change, unless . . . his original temperature data didn't show any convincing rise in temperature at all and it had been conveniently "lost" in consequence? And it is not his temperature data anyway. The whole CRU was in fact set up in the early 1980s (with funding from the U.S. Department of Energy!) to produce the world's first comprehensive record of surface temperature. Phil Jones and Tom Wigley were sent data gathered over the course of decades by thousands of temperature recording stations located in dozens of countries. This "Jones and Wigley" record, as it is called, served until 2007 as the primary reference standard for the UN climate panel. Did the raw temperature data contain an inconvenient truth? Can anyone spell c-o-v-e-r u-p? The graph was questioned even by the Global Warmers themselves, one of whom wrote that "Mann is an outlier though not egregiously so." (Curt Covey to Christopher Monckton, 5 February 2007). Graph 1: The "Hockey Stick" Graph Used by the UN Climate Panel: Note the exaggerated warming at in recent decades, which has been called into question by Climategate. Mann refused to release either his data or his algorithm for years, but the Climategate e-mails reveal an even more disturbing instance of cherry-picking data. The story is too complicated to tell in detail (the whole sordid tale can be found here,) but it involves another famous "hockey stick" graph, this one based on tree rings from Yamal, Russia. This was crafted by another CRU Global Warmer, Keith Briffa. It went on to be used in a dozen other temperature reconstructions, all of which the UN climate panel said validated Mann's original graph. But Briffa, like Mann and his own boss, Phil Jones, for ten years refused to release the data on which he based his graph. When Briffa's hand was finally forced a few weeks ago, it turned out that he had used only a tiny, biased fraction of the raw data available. When skeptic Steve McIntyre calculated a revised chronology based on more complete data, the sharp temperature increase at the end of the twentieth century simply vanished. The twentieth century now showed no significant trend. The blade of the Yamal hockey stick was gone. Phil Jones later claimed in an e-mail to Graham F. Haughton on 27 October 2009 that "The claims of [Steve McIntyre] are exaggerated." Left unanswered is the question of why his Institute seems to specialize in cherry-picking data to bolster the case for "Global Warming," while keeping the original data -- which weakens the case -- under wraps? Graph Two: The CRU Archive, showing a spike in temperatures during the late twentieth century, based on a few, cherry-picked data points. The Schweingruber variation is a complete data set from the same area showing none. The warming trend of the early Twentieth Century, which ran from 1910 to 1940, is a major embarrassment for the Global Warmers. 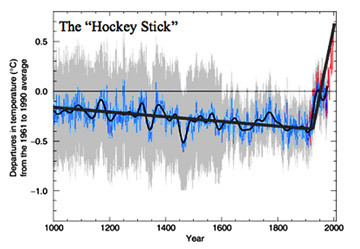 They can't simply ignore this "bend" in the hockey stick, because it is too well-known and too well-documented. But neither can they blame it on people and their infernal combustion engines, since atmospheric CO2 scarcely increased over this time period. "I am fudging the data to take out as much of the ocean warming as I can. I can't take out all of it, because then we would have no explanation for the land warming, which would raise suspicions. But even with my fudge factor, we still don't have a convincing explanation for why the ocean warmed during this period." Why the blip, indeed. By the way, the Climategate deniers who dissed the e-mails as "ten years old" should note that the date on this one is 27 September 2009. Trick No. 4: You Cherry Pick the Model to "Prove" Global Warming is Real. "The figure you sent [from Gavin Schmidt] is very deceptive. As an example, historical runs with PCM (Parallel Climate Model) look as thought they match observations -- but the match is a fluke. PCM has no indirect aerosol forcing and a low climate sensitivity -- compensating errors. In my (perhaps too harsh) view, there have been a number of dishonest presentations of model results by individual authors and by [the UN climate panel]." The response, from Schmidt himself, makes it clear that he was working backward from the recent cooling trend to salvage the Global Warming models. "The kinds of things we are hearing, "no model showed a cooling", the "data is outside the range of the models," need to be addressed directly," Schmidt explained. His "very deceptive" figure was an effort to make the real world data showing static or cooling temperatures appear not to contradict the model predicting Global Warming. You get the idea. You won't hear them talk like this in public, of course, where they close ranks in defense of their increasingly discredited theory. Trick No. 5: You Spend a Lot of time Promoting Your Views with the Media -- and Publicly Attacking Your Skeptics. When the BBC finally -- after a decade of no global warming -- began to tentatively question whether temperatures were rising after all, the Global Warmers circulated frantic e-mails entitled the "BBC U-turn on climate." Trick No. 6: "The Science is Settled. The Science is Settled." Realizing that their models are open to question, the Global Warmers have tried frantically to shut off debate by chanting in unison: "The science is settled. The science is settled." Critics are mocked and derided. When one scientist suggested that skeptics like Fred Singer and Lord Christopher Monckton be taken seriously, "Hockey Stick" Mann exploded: "I can't believe the nonsense you are spouting, and I furthermore cannot imagine why you would be so presumptuous as to entrain me into an exchange with these charlatans." I understand that the IPCC's [the UN climate panel's] 2007 draft does not contain an apology for the defective "hockey-stick" graph, which the US National Academy of Sciences has described as having "a validation skill not significantly different from zero." In plain English, this means the graph was rubbish. It is difficult to have confidence in a body which, after its principal conclusion is demonstrated in the peer-reviewed, scientific literature and in numerous independent reports as having been useless, fails to make the appropriate withdrawal and apology. Worse, the UN continues to use the defective graph. This failure of basic academic honesty on the IPCC's part was the main reason why I began my investigation of the supposed climate-change "consensus". Contrary to what you may have heard, the science of "man-made Global Warming" was never settled. Now that these e-mails have exposed the duplicity of that theory's chief backers, perhaps we can begin trying to understand what, if anything, is really happening with the earth's climate. For, as Kevin Trenberth admitted to Mike "Hockey Stick" Mann on 14 October 2009: "The fact is that we can't account for the lack of warming at the moment and it is a travesty that we can't." The e-mails do prove one thing, however. They make abundantly clear that much of what was presented as objective "scientific research" by the Global Warmers was nothing more than cleverly disguised advocacy for the radical environmentalist, radical anti-people belief that man is slowly destroying his planet. At the end of the day, it may turn out that the only thing "man-made" about Global Warming is the hysteria and hot air that has been generated by theory's heated backers. That is certainly anthropogenic.